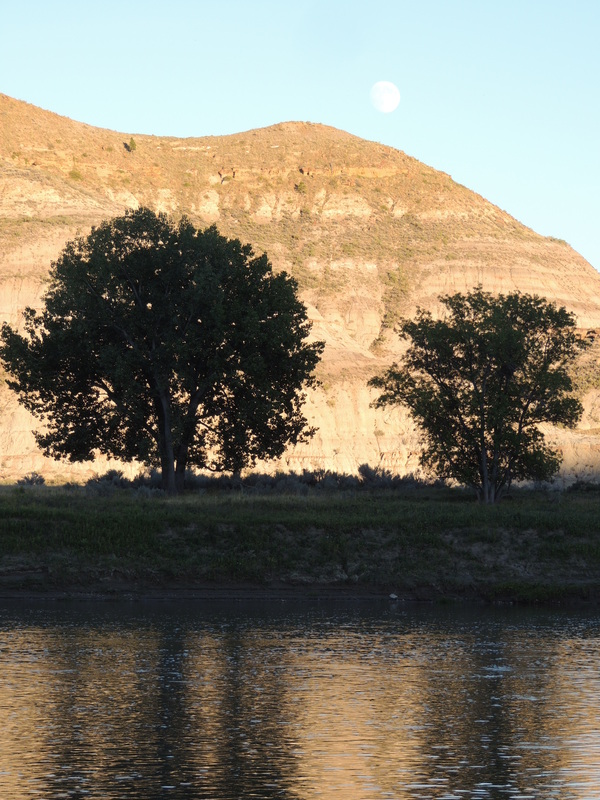 The Missouri Breaks: Back to 1805. 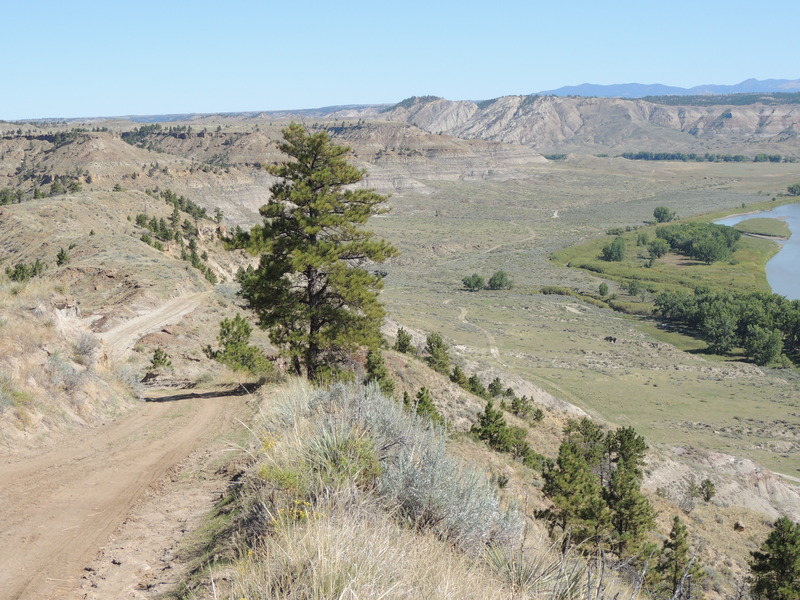 On our second day in the Missouri Breaks we heard a four-wheeler grinding its way down the steep road to our camp on the banks of the Missouri. A few minutes later a grizzled and weathered rancher with a border collie pup on the seat behind him pulled up and asked if we’d seen any of his cows. Nope, we hadn’t. We’d seen some across the river, but those weren’t his. He reckoned he’d need to get out on horseback to find them; too many gullies and ravines for them hide in this country. I reckon so too. How do you find a few cows in the middle of this? 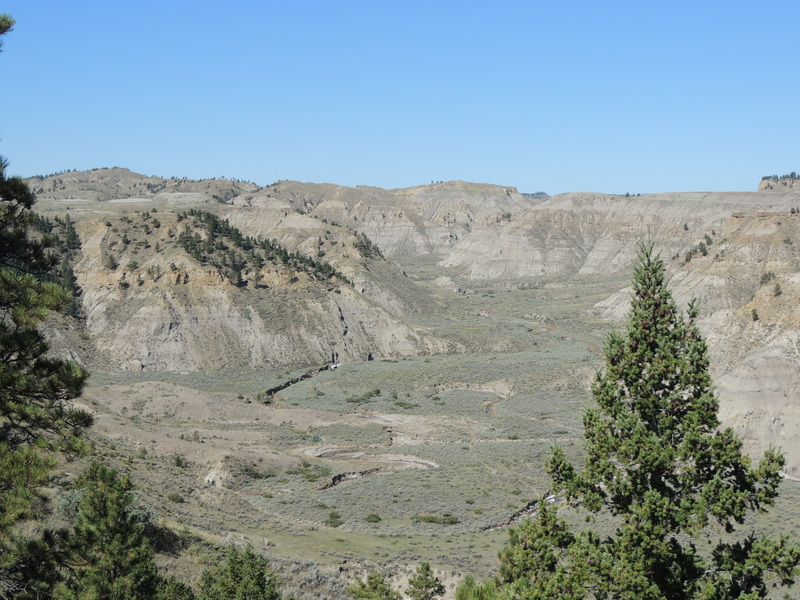 The Missouri Breaks is one of the most isolated spots in the lower 48: with the exception of a few cows and the occasional rancher, you’re not likely to see anyone during your visit here. 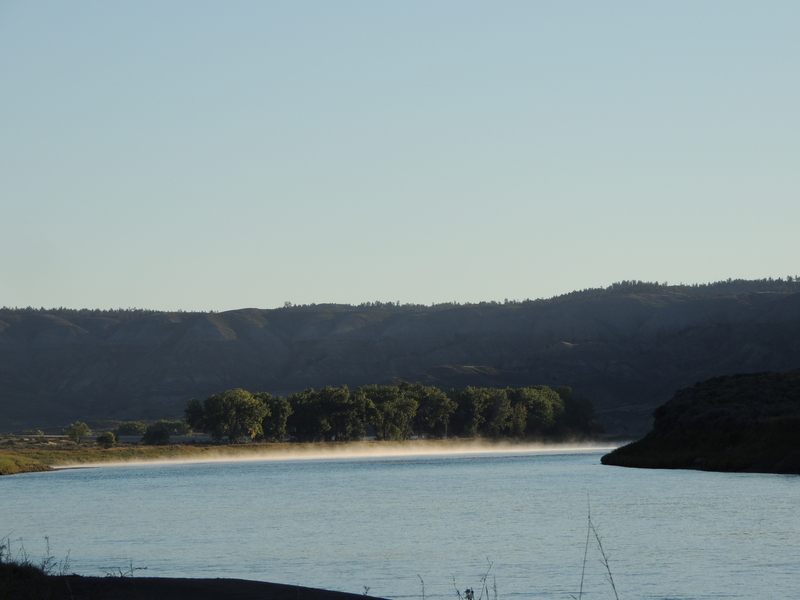 The stretch of the Missouri between Fort Benton and the Fort Peck lake is also one of the least changed stretches of the Missouri; it looks the way it looked to both the Indians and the Lewis and Clark Expedition. 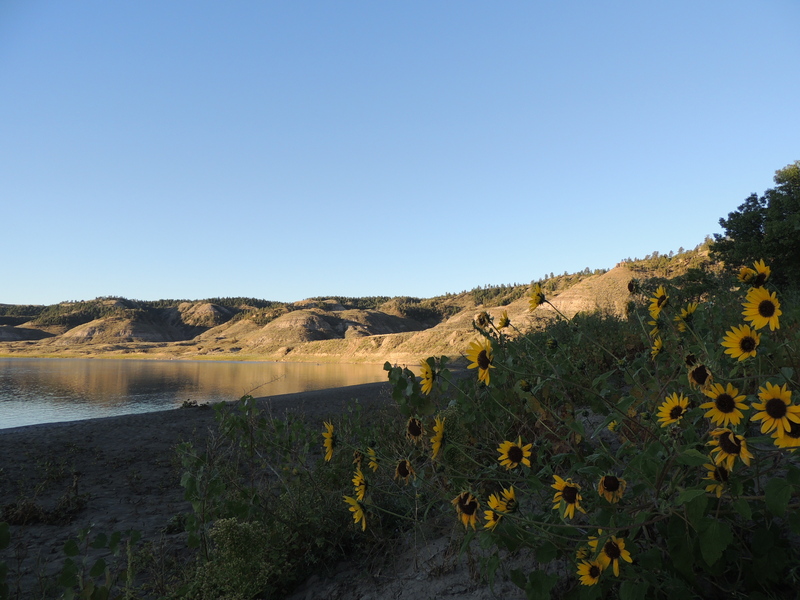 We were, in fact, camped near the spot where the expedition camped on the way west, on May 25, 1805, and where Meriweather Lewis also camped on July 30, 1806 his way to meet Clark at the confluence of the Yellowstone and Missouri Rivers on their return trip. 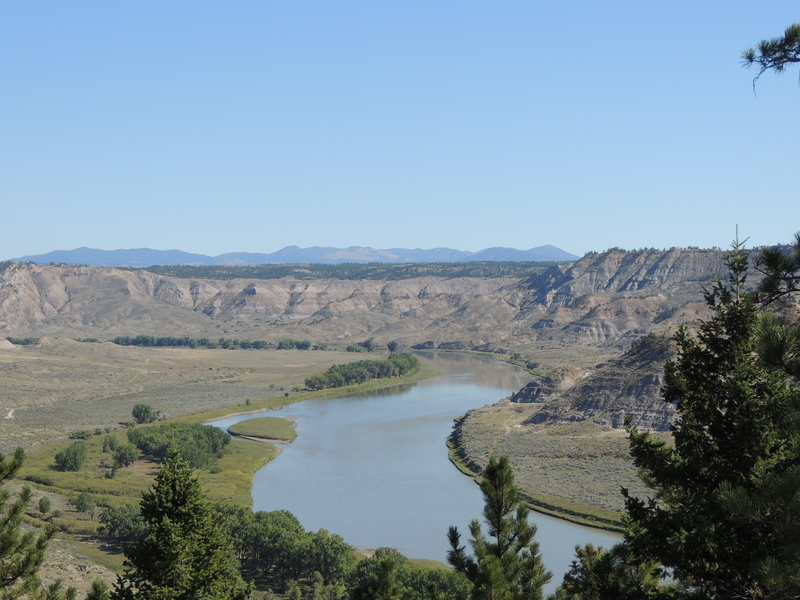 In the May 26 journal entry, Lewis climbed the bluffs along the river, a “fortiegueing” job, but when he reached the top he was rewarded: “from this point I beheld the Rocky Mountains for the first time.” He could easily have stood at the spot where I took the above photo. I was not too “fortiegued”, having the benefit of a pickup to carry me up. 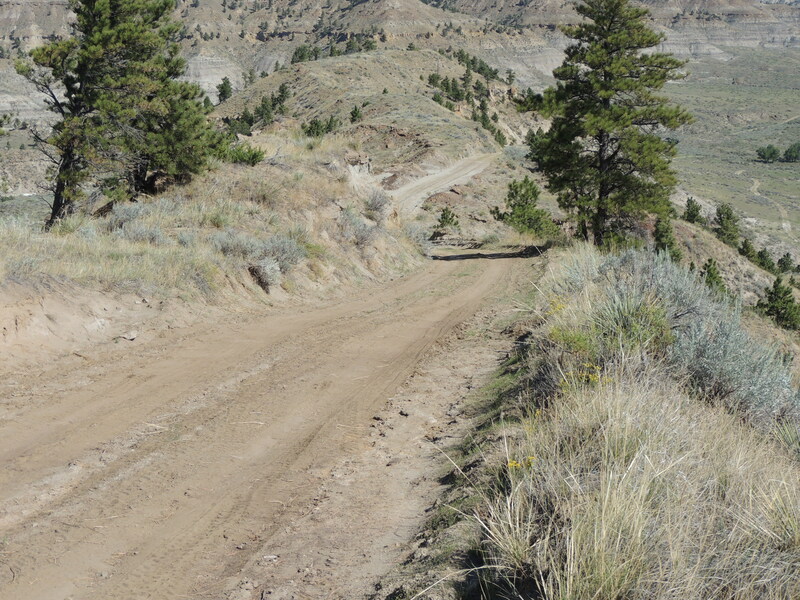 The road to Woodhawk Bottom, where we camped, is plenty steep. You wouldn’t want to tackle it after a rain, that’s for sure. 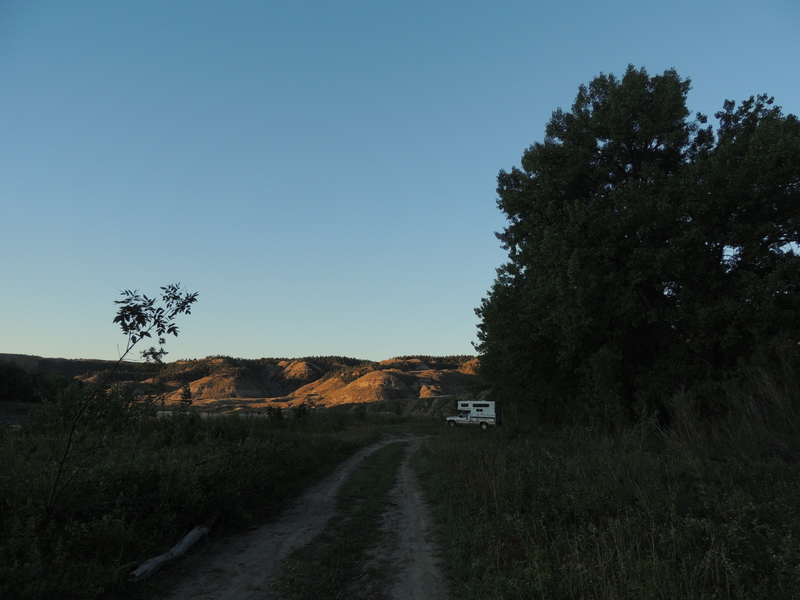 We camped in the cottonwoods at the bottom. Evening and morning are when you can really appreciate the solitude and isolation of the breaks. 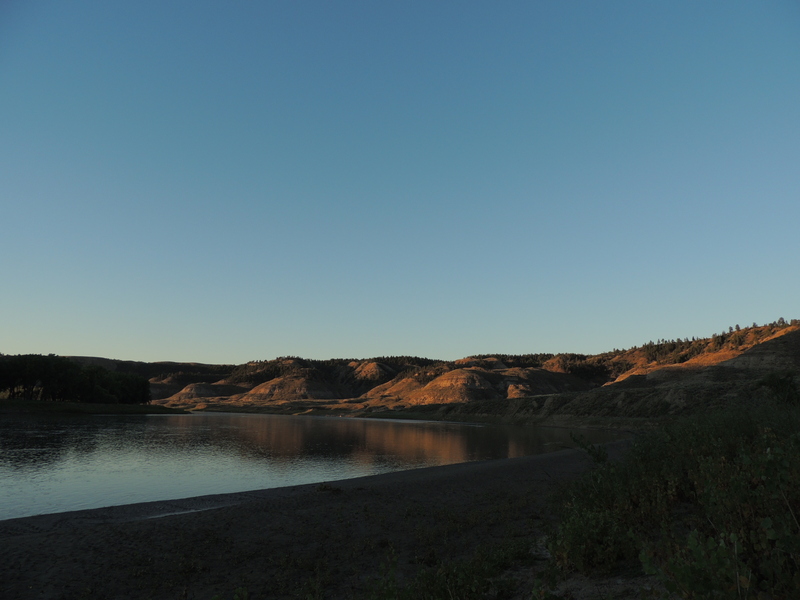 The nearly full moon rose across the river just as the sun was setting. 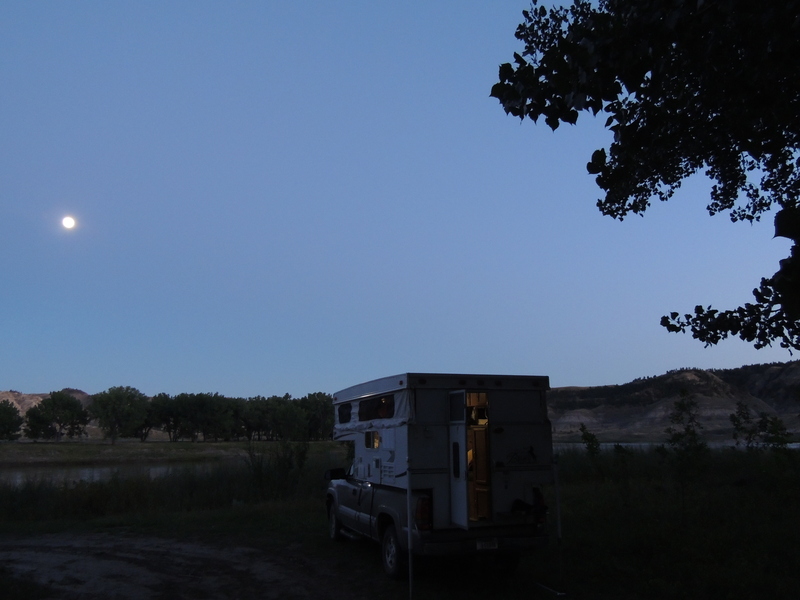 Coyotes called to each as the moon rose, and a crabby kingfisher zipped into the cottonwoods above us and kept up a rattling scolding until he decided we weren’t going anywhere, no matter how long he yelled at us. Then, silence. Sunrise was magic as well. Can’t you just see William Clark sitting on this bank, writing up his notes? 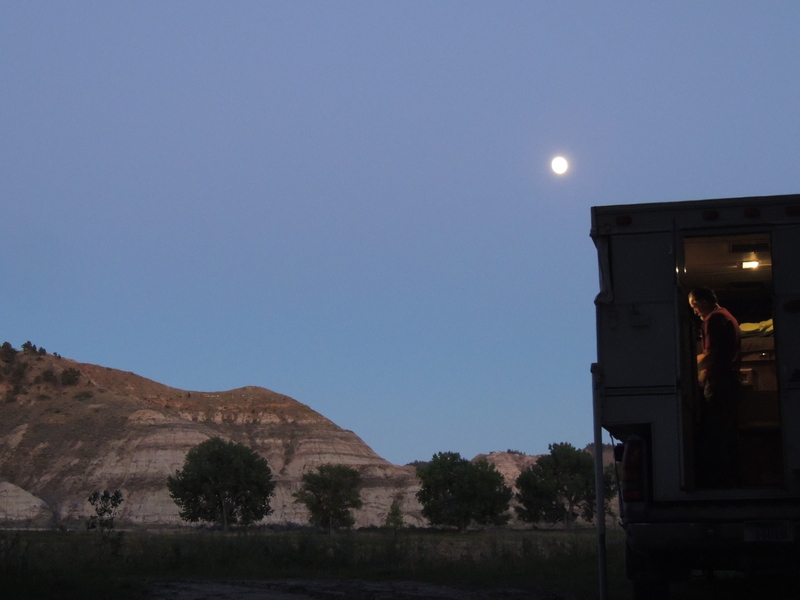 This entry was posted in Adventure, Camping, History, Montana, Nature, Travel and tagged Lewis and Clark May 25 1805, Missouri Breaks, Missouri Breaks National Monument, Woodhawk Bottom, Woodhawk Trail. Bookmark the permalink. 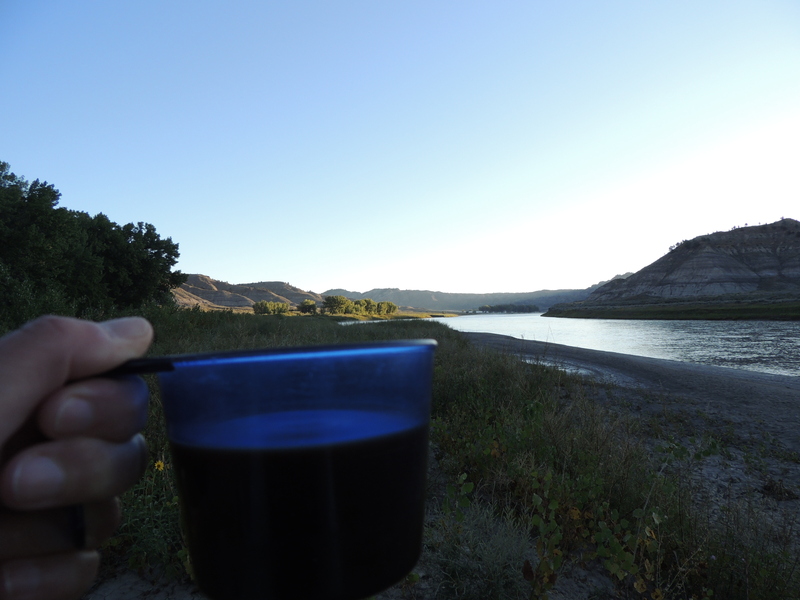 17 Responses to The Missouri Breaks: Back to 1805. There’s something special about being alone in a place like that. There is! Since I grew up on the East coast, it used to make me a little nervous, but now I find I need that solitude once in a while. What a great story. I felt like I was there with you. And I loved the little history included too. That’s great to hear – thanks! It is pretty remote! Thanks. Fabulous, I love places like that. Your kind of country, for sure! I think the removal of spring flooding has changed things quite a bit. Less obvious than pavement. Good point. But since the dams are there, this is probably as close as we’re gonna get. Alas, yes. I wonder how Cottonwood reseeding is being affected. nice country! and it’s cool when you’re following some very old footprints. It does add something to know the specifics about who was there before you. We always know that someone was around, but can’t always get the detail that the L & C journals give us. 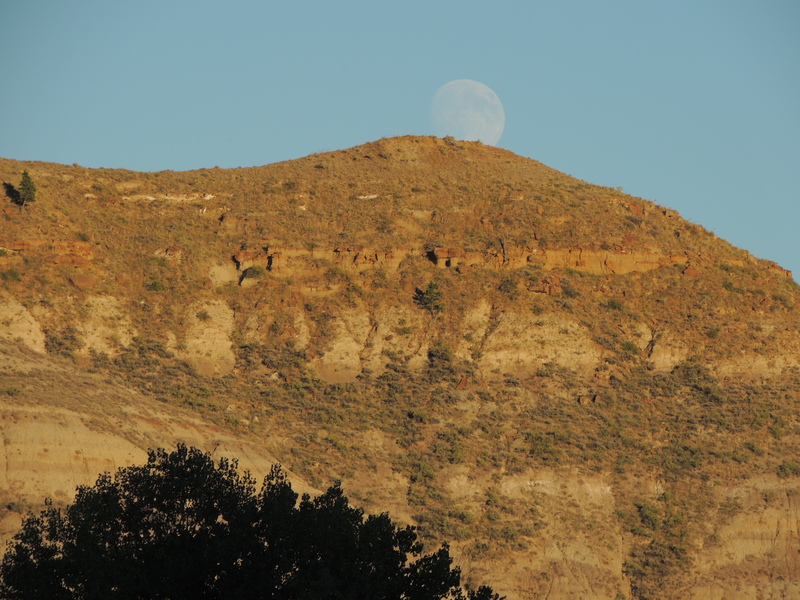 Wow, that first shot of the moonrise!!! I like that one too! Thanks.